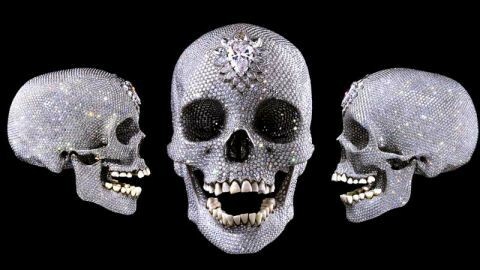 A diamond-encrusted platinum skull by British artist Damien Hirst is seen in this undated handout file photograph released in London June 1, 2007. The skull has been sold to an investment group for the asking price of $100 million, a spokeswoman for Hirst’s London gallery White Cube said on August 30, 2007. REUTERS/Prudence Cuming Associates/Handout/Files (BRITAIN). EDITORIAL USE ONLY. NOT FOR SALE FOR MARKETING OR ADVERTISING CAMPAIGNS.